Kern County is a large county that extends from the southern San Joaquin Valley up the southern Sierran slope and across a chunk of the high desert. It thus has a wide variety of habitats from bone-dry low hills around Maricopa to rich riparian forests along the Kern River and at Lake Isabella, and from high desert Joshua Trees to coniferous Sierran forests. Kern NWR, off to the west, is good for migrants and waders. In the last two decades, active birders have discovered great vagrant traps in the high desert of eastern Kern. By now, Butterbredt Spring and Galileo Hill and California City are all household words in the California birding world. 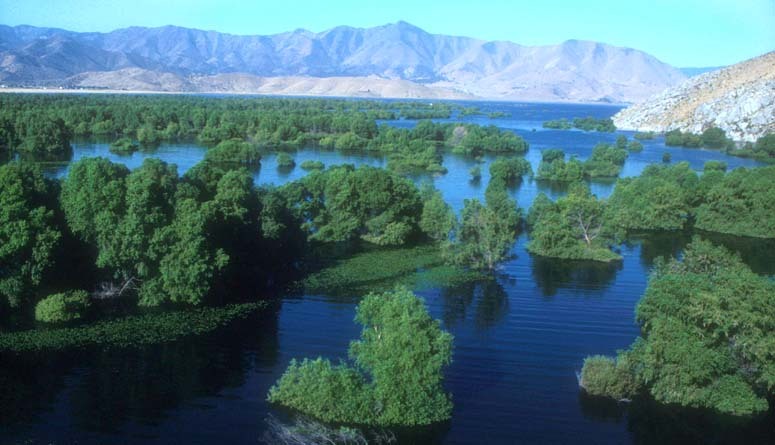 Also famous is the gratifying success environmentalists have had in preserving exceptional riparian forests near Lake Isabella at the Kern River Preserve. Through extensive habitat restoration and judicious cowbird control, managers have succeeded it re-establishing Willow Flycatcher and Yellow-billed Cuckoo has regular parts of the breeding avifauna. County birding statistics and links are on Joe Morlan's site. There is also fine on-line avifauna for eastern Kern County, by Matt Heindel; it is in pdf format and can be downloaded from Morlan's site. For Kern County the picture used above is my only photo taken with high-end equipment in the 1980s. I spent a day with Arnold Small, Herb Clarke, and Clyde Bergman birding the Carrizo Plain to the slopes of Mt. Pinos (we had 3 wild California Condors that day). 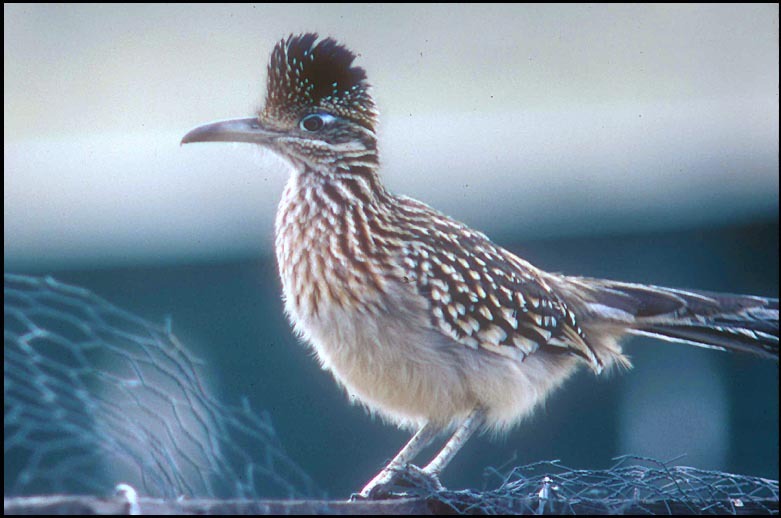 Just about on the KER-SLO line we came upon this Roadrunner sitting up on a fence. We stopped the car to photograph it out the window, but since the bird was perched on a fence with wire, Herb said it wasn't worth shooting [he prefers all his photos to show birds perched on native strata rather than man-made structures]. So I asked if I could borrow the camera -- and I shot this photo with Herb Clarke's equipment. Okay, I didn't get the framing right (I cut off the tail) but what a difference in quality from my low-end equipment! What a difference a $2000 lens can make! Even to this day I don't have a $2000 lens . . . you can only do the best you can with what you have. I haven't taken very many other photos in this county to date, although I have chased a number of vagrants at Butterbredt, Galileo Hill, and California City. 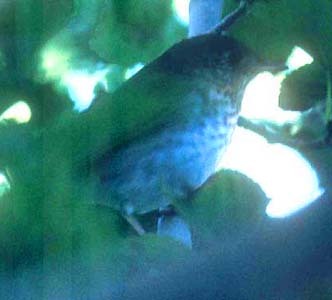 One of them was a Veery at Galileo (below left; 21 Sep 1991) but the photo is very marginal. 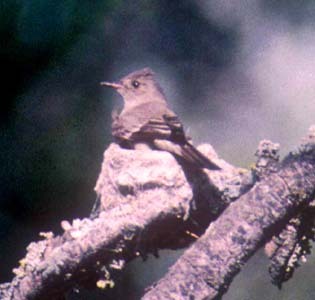 I've also been up to Greenhorn Summit once, and shot this Western Wood Pewee on a nest (10 July 1999). The upper photo is a shot from the flat, dry western end of Kern County: a sunset at Lost Hills (late May 1992). 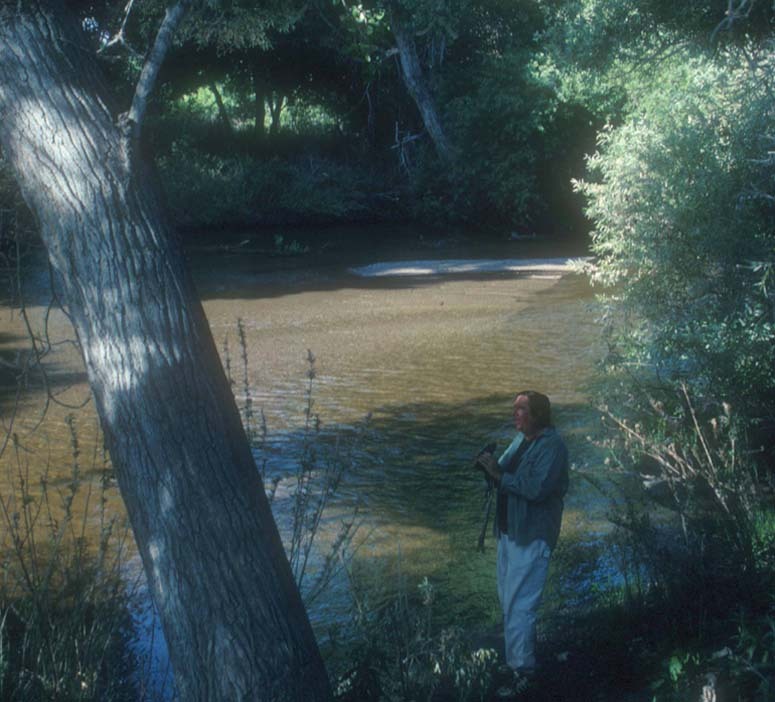 The two photos below that show some of the habitat at Kern River preserve and environs: the delta at Lake Isabella and then rich riparian woods along the Kern River; that's Bob Barnes, the preserve manager for many years, with the binoculars (both photos taken 18 Jun 1997).